The castle of La Buissière protected the road down to Grenoble on the right bank of the River Isère. 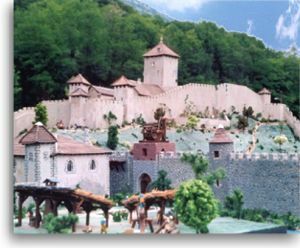 Its strategic importance will vanish near the end of the 13th century when the northern castle of Bellecombe will be transferred from Savoie to Dauphiné. The castle (known as "Château Dauphin", Castle of the Dauphin) is located on a hill above the former fortified village called "La Ville".